If you need to keep your devices charged out and about this might be the gadget for you. 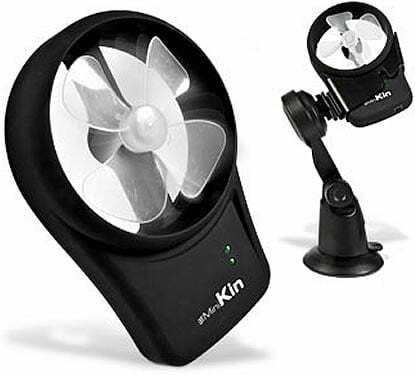 The Mini Kin Green Power Generator is a small wind generator with a rechargeable battery pack that you can then use to charge your devices. If your loaction doesn’t provide the required wind you can strap it to your arm or bike and convert that natuyral resource into juice easily. The wind turns the propeller, which in turn powers the turbine and creates enough energy to power up your gadgets. Perfect for the little green person inside all of us and its incredibly satisfying to say that your mobile is wind powered! Available for $47 over at the I Want One of Those website.